The population of the most populous city on the planet is on the move. In the 1950s just 13% of people in China lived in cities. By 2010 that figure was 45%, and by 2030 that figure will rise to over 60%. Living more densely can reduce the amount of carbon emitted per person with people walking rather than driving to the shops, and by being packed into smaller spaces. The disadvantages include a major disconnect with nature and the areas that produce and supply cities with food and fibre, to such a degree that it can be very difficult to judge the impacts of our behaviour on the rest of planet - even if we wanted to. We're increasingly training ourselves to judge food by the information on the packaging, and to look for organic, Fairtrade, MSC and other certifications, but how on earth would you go about judging whether the amount of meat you eat, or the amount of clothes you buy is sustainable from a global perspective? WWF's third Hong Kong Ecological Footprint Report, released last week, peels back the veil on a city famed for its potential for consumption. So what does the report say about the levels of consumption of natural resources (e.g. food, fibre and the amount of forest needed to sequester the carbon we emit) required per person in one of China's most modern cities? The top-line numbers make for grim reading. Global humanity now consumes natural resources 1.5 x faster that they can regenerate, in Hong Kong that figure is 2.6 x. In other words, if everyone in the world lived as affluent a lifestyle as we do in this corner of South China, we would need 2.6 planet Earths to produce the natural resources, and soak up our carbon, sustainably. That is impossible, and the end result of even current global levels of over-demand are oceans being stripped of their fish, forests being felled and a planet that's warming. It wasn't always like this. In 1962 the average person in Hong Kong needed around 1.2 hectares of land and sea (somewhere in the world) to produce the food they eat, provide space for their housing and other infrastucture, and for the forests to sequester the carbon emitted. Now we each need 4.7 hectares, a whopping 400% increase. For reference a football pitch is about 1 hectare in size. 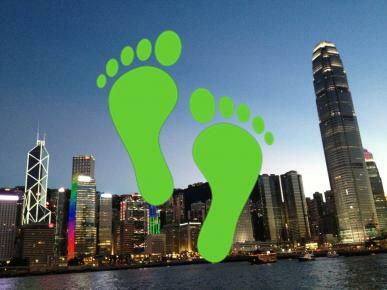 More than half of Hong Kong's ecological footprint is made up of its carbon footprint, and not just from the carbon dioxide emitted within our borders. The footprint for the goods that you and me buy is even higher than for food, despite importing delacies from literally across the planet. That is primarily as the amount of carbon to produce and import all those lovely clothes, furniture, and shoes etc. to our city is way higher than for our food. Giving another reason for you to think before you indulge in a spot of retail therapy. Buying and wasting less are obvious things that we can all do to reduce Hong Kong's ecological footprint, but this is also an issue which demands governmental attention. The mainland Chinese government at the highest levels has accepted the principle of ecological footprint as a measure of sustainability, now we need to see Hong Kong doing the same. Fortunately, the process now underway to formulate a biodiversity strategy for Hong Kong under our obligations to the Convention for Biological Diversity (CBD), will certainly look into the issue, as CBD encourages countries to guard against damaging the biodiversity of other nations, as much as safe-guarding their own.